how to read and tune a dellorto 21mm phbg carburetor. 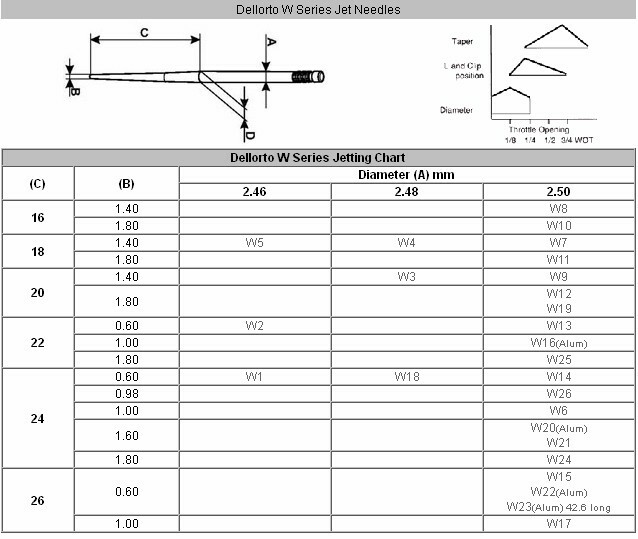 heres teh needle jetting chart http://www.motorcyclecarbs.com/Dellorto_W_Series_Needle_Dimen_W278C975.cfm a link to it. noone has this good chart. and most places link to some other chart where someone hand held measured all these needles. andtheir wrong. on some of it. and it messes u up. thisll straighten you out when your jetting your needles. so heres how to properly read your needles for a dellorto phbg carburetor. plus, this is the needle chart specifications for the W needle's set. for dellorto carburetor's. im going to upload a picture of that jetting chart. dont know how long it will last. il have this file. i keep it in case my internet goes out.